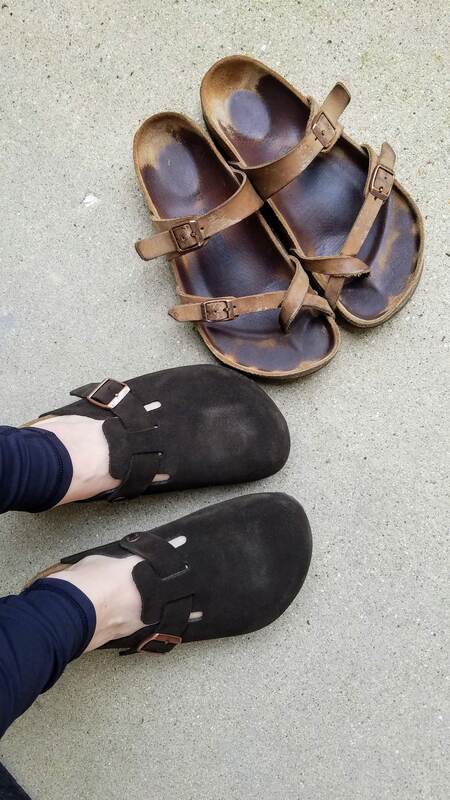 I didn’t over-think or cherish them as I should; My Birks were simply my shoes. They were still in their prime of life, no more than a mere 7 years old, when I had a few pregnancies and my feet grew a size. On March 9th, 2006, I was on another minimalist kick and found them dusty and unloved in the way back of my closet. I donated them along with a bunch of other old shoes that would never fit me again (Exhibit C — don’t ask me why I have a picture in a pre-cell phone camera age — except suffice to say that there is a reason it is “Kelly and her Camera”). Lilith Fair and The Grateful Dead had moved on and so must I.
I rarely buy cheap shoes. I’d rather have one pair of shoes that feel like walking on clouds than 5 pairs of terrible ones. So for 25 years, I tried a bunch of high-end sandals that I loved. My Keens hiked all over the US with me. My Chaco flip-flops barely left my feet and loved saltwater. My Born sandals were leather and cushy. I went through at least 6 pairs of Tevas. 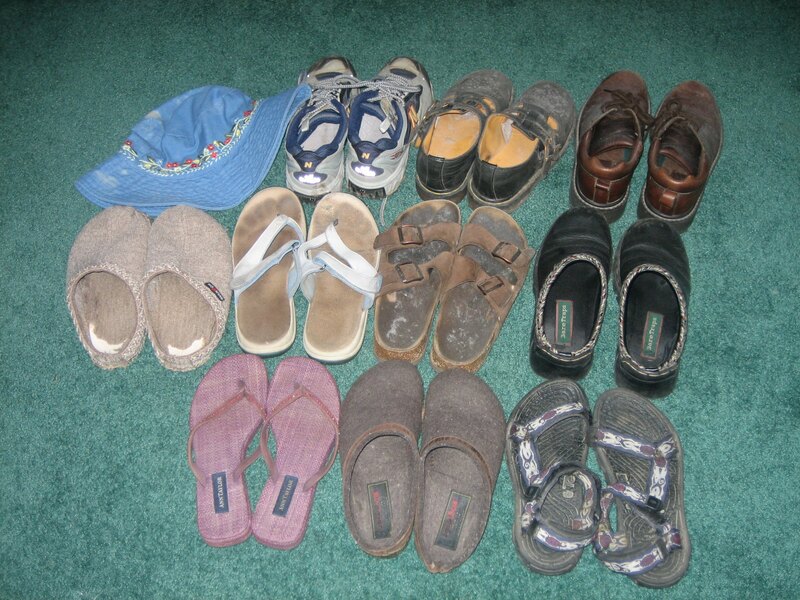 They were all good and they all got a little smelly and they all wore out and they all got tossed because they were in no state to donate or repair, even after only a few years– and I needed a different pair of sandals for everything. And then on February 11, 2016, I was walking through a Nordstrom in San Fran and there was a LIT DISPLAY WITH BIRKENSTOCKS! If they were in San Fran, it was only a matter of time before they were in Chicago!!! I texted a pic to my little sis (who is much much much more fashionable than myself) and told her the amazing news. I could buy Birks again!!! She called me immediately, sighed heavily, and told me that they had been in style for 2 years and she was hoping that I wouldn’t find out but that she knew it was only a matter of time. You might expect that I bought a pair at that instant. But I did not. I could not react, I needed to think and respond. My whole world was changed! The Dead were touring with John Mayer and I had just sent in our heavily decorated envelope to get into the ticket lottery! I had seen Sarah McLachlan live at Red Rocks and she was happy and it made my soul tingle! I loved Bernie Sanders with the optimism of a college student! And somehow the world had come full circle! I couldn’t be sure but I hoped that Birks were as comfortable as I remembered and I imagined I would be wearing these shoes for the rest of my life. So many choices of style and color! There were SO MANY options now!! I ended up with the Mayari Birks. As much as I wanted a fun teal, I went with my traditional color, oiled Habana brown because to me, Birks are about silent and timeless support, and I was afraid the colors were too much. I was pretty much waiting at the door for Zappos. I put them on immediately and they were like walking on clouds. Very firm clouds, but my feet felt like they were home. The next day we went downtown and I know better than to ever wear new shoes on a long walk the first day, but these never bothered me once. We walked six miles of pure bliss on the very first day. 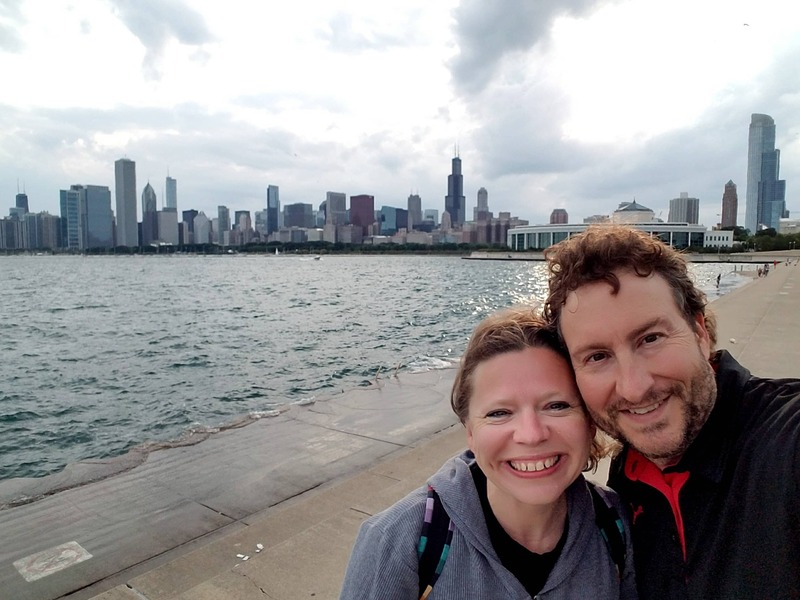 I took them to concerts where they were ordained with an entire beer and the beach and to museums and on vacation and hiked up mountains and walked 12 miles in a day and never felt the need to take them off. I even found myself wearing them in the house. My feet felt free but supported and so happy. I’m trying to think this through, but I honestly believe that another shoe did not touch my foot for the next 6 months. And I have semi-permanent tan lines to prove it. I swear that I even wore them to a funeral. My daughter kept slipping mine on and walking out the door — and then she admitted that it was worth matching her mother. That she wanted a pair of her own, same style, but in black (vegan). I found her a pair within days and then she didn’t take hers off either. And together we had free feet and a soulful connection to our shoes. For winter, I went back to my Clark’s comfort Janey Mae’s (which frankly, are REALLY good for tie shoes. I can wear those for miles and probably write a love story for them also). But this winter, I just can’t. Shoes are so restrictive. I need something I can just slip on to run the kids out to school or swing by the grocery store without the hassle and inconvenience of reaching down to tie. And my feet told me that they really really miss their Birks but my age told me that my feet were cold and needed socks. Even as a 40+ year old… I’m still gifted money from my folks for my birthday and I knew EXACTLY what I was going to buy. 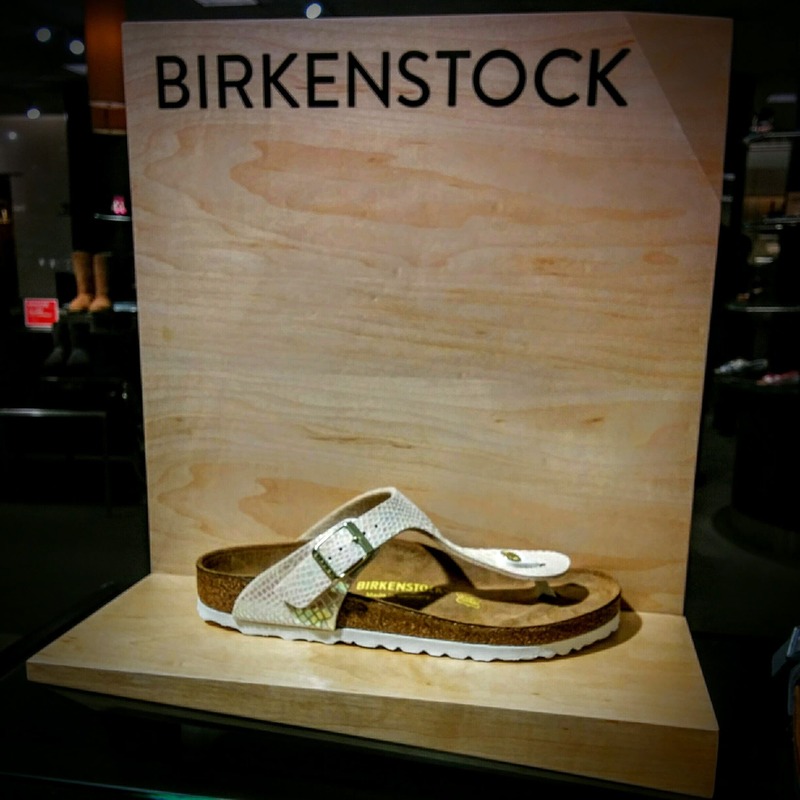 The Birks Boston Clog. I tried them all on and decided on suede with the soft footbed. Again the Zappos delivery guy was probably a little shocked by how close I was to the door. I tried them on and they are like walking on clouds. I think I like the soft footbed for a winter shoe. My joints are always a little achy in the winter and a little extra cushion seems like it will be nice. They are pretty much the same as a normal footbed but feel like there is a small layer of foam just under the surface. They do take a strange breaking in, the Birks Boston Clogs. They have that new Birk baby fuzz still on the sole and the uppers. Which makes them hard to get on with socks because the socks and the inside of the shoe kinda grip together. I’m going to try breaking them in barefoot for the fall and see if, by winter, they are a little easier to get on with a sock. But comfort wise, they are amazing! And they feel great without a sock so it won’t bother me to wear off the baby fuzz like this. There are a million love letters to Birks online. Make sure to research in order to have the best hope of finding your soulmate-shoe. Originally, I assumed I’d want the more thong like one (which I still may get at some point) but decided that the three strap ones were more practical for hiking and my life. Stores only carry a few colors. I always try to buy local, but Zappos has all of the colors and I ended up buying both of mine through them because stores didn’t carry the exact combo. Especially if you’ve been wearing cheap shoes, Birks will probably hurt at first. Mine rub in a few spots but some people say that theirs took a few weeks to break in and they could only wear them for small periods of time. Mine aren’t really like that but I can imagine that if someone’s poor feet aren’t used to good support, it might be a bit shocking for them. Be patient. Eventually, your feet will request demand the Birks. Birks can get wet. I don’t think they should be your go-to shower shoes, but they have no problem getting wet. Just dry them slowly; Like not in the sun because the cork and leather will crack if it dries too fast. The maintenance is pretty minimal. I usually moisturize my leather purses, boots, shoes, and sandals once a year, at the end of their season. I sort of embrace Marie Kondo, give them a little love, thank them for helping me through the season, and then put them away in their special box. 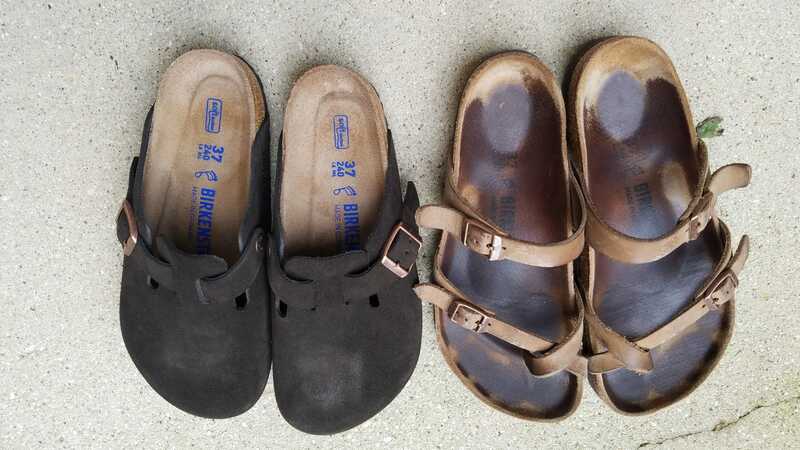 Birks are no different, except that I keep them out all year because I wear them the first moment that my feet don’t freeze but they just need a little leather moisturizer and some cork sealant. 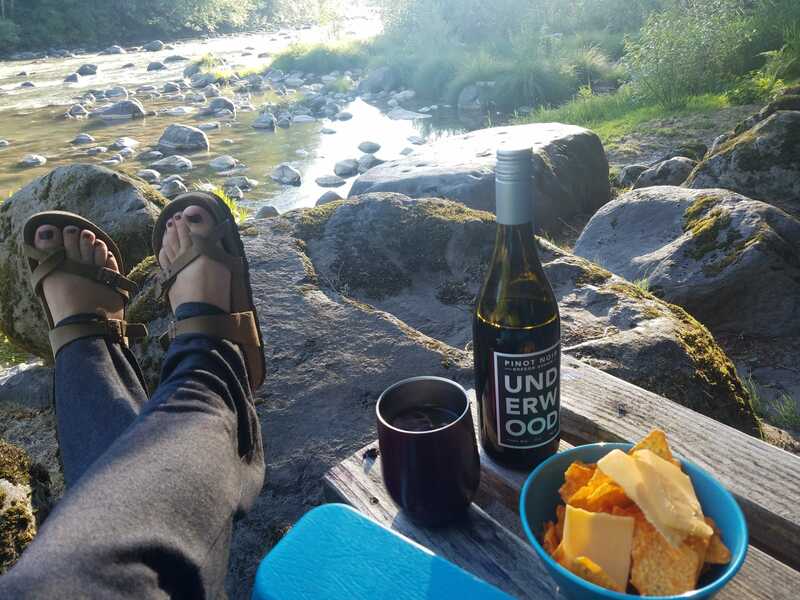 Chillaxing still in my Birks after a 4-mile hike straight up Mt Hood— on sand.